Nice neoclassical drawing with a young couple walking in a park. It is a work of Viennese amateur female artist Adelheid Viertler, Edle von Weydach. Creator:Adelheid Viertler, Edle von Weydach. Creation Year: 1815. Description: Source unknown, to be determined. With a very finely written dedication to Charles Pitcairn. Artists and Engravers: Made by 'Lieutenant colonel A. I. Ziegelas' after 'Lieutenant colonel A. I. Ziegelas.'. Lieutenant colonel A. I. Ziegelas was active in Kampen around 1830-1835. Tito Agujari was a very well known Italian painter of the second half of the 19th - early 20th century. in Trieste, where he taught for about 30 years. Tito Agujari was known for his landscapes, portraits, religious and historical paintings in academical style. (1) King Louis XVIII (1755-1824). 6) and finally, the latter's younger brother, the third and youngest child of Louis XVIII, Charles Ferdinand d'Artois, Duke de Berry (1778-1820). Joseph Francois Leroy (1768 Paris - 1829 Paris) was a pupil of Joseph Benoit Suvée and - besides painting historical paintings - specialized in painting of portraits in oil and in miniature. He was a pupil of his father, Louis Leopold Boilly and Baron Antoine-Jean Gros. He made illustrations for "Les Hermites en Prison" by Etienne de Jouy and Antoine Jay (1823), "Monde dramatique" (1835), "Plutarque francais" by Ed. 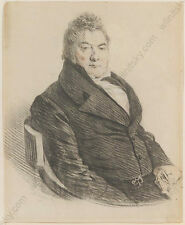 Traugott Georgi was born in Schwarzenberg, Germany, in 1783. T.Georgi is considered a very well known German portrait, genre and landscape painter. Creator:Traugott Georgi. Creation Year: early 19th Century. Portraits of Mr. Popitz-junior (succeeded his father as an Archidiakonus of the Church Schlosskirche in Dessau, capital of Duchy Anhalt-Dessau) and his mother Sidonie Popitz, nee Reil. He extensively studied thoroughbred horses at the royal stables. "Portrait of a Boy / Male Portrait", English School, two-sided drawing, 19th C.
Creation Year: early 19th Century. MALE PORTRAIT. Style: Portrait Miniatures. Technique: charcoal on paper. PORTRAIT MINIATURE. CHILDREN PORTRAIT. Creator:English School. Creator Dates: -. 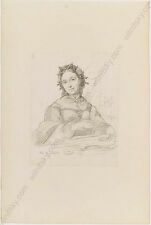 Wilhelmina Gebhardt-? "Junior officer of Guards infantry of Kingdom of Poland"
In 1846 she received from the Imperial Academy the rank of an "out-class" ("free") artist of watercolor and miniature painting. She lived and worked mainly in Moscow. This miniature bears a ligated monogram in Cyrillic that could be interpreted as either GW or WG. Auguste Henri Joseph Pidoux was a portrait painter and lithographer in Paris where he exhibited at the Salon in 1834-1849. Creator: Auguste Henri Joseph Pidoux. Creation Year: 1850. Condition: In good overall condition, slight spots of foxing, matted. She was born in Exeter, England as daughter of Gilles and Angelique Martin. In 1830 she immigrated to the USA with her parents and lived in New York. In 1833 the family moved to Marietta, Ohio, where Lilly's father worked as a teacher. Style: Portrait Miniatures. Artist's nationality: German. OTHER: CERTIFICATE OF AUTHENTICITY IS ISSUED UPON REQUEST. Year: ca.1815. good; dot foxings throughout. Year: ca.1815. Artist's nationality: Russian. French profile of a "Gentleman Wearing a Hat", 1862. A drypoint etching on woven paper with margins. Text in margin reads: print et grave par Manet, 1862; Imp. A. Salmon. Published by A. Salmon, Paris, France. Framed and glazed. He extensively studied thoroughbred horses at the royal stables. Prince August of Prussia and Count Neidhardt of Gneisenau helped him to acquire high patrons, who let portray themselves on horseback and with retinue. Robert Theer (1808-1863) "Partial copy after the self-portrait of J.B. Lampi"
Robert Theer (1808 Johannisberg/Austrian Silezia - 1863 Vienna) was a well-known Viennese portraitist and lithographer of the early 19th century.He was born in a well-known family of artists, son of a gem cutter Joseph Theer, brother of the painters Adolf Theer and Albert Theer. Charles Backofen (ca.1801-aft.1860) "Portrait of a German military officer"
Charles (Carl) Backofen was born in ca. 1801 in Germany. Another reference source says that the artist exhibited between 1853 and 1855 at the National Academy of Design. One should not exclude the possibility that Carl Backofen was the latter's pupil at the Berlin Academy. The well-known Irish painter Sir Frederick William Burton (1816 Corofin House/Co. Clare - 1900 Kensington) started his art studies at the "Dublin Society Schools" in the age of only 10 years and with 16 years exhibited as a professional artist at the R. Hibernian Academy. In 1854 the Imperial Academy of Fine Arts awarded him a title of "neklassny khudozhnik" (English: out-classed artist). Creator: Sergei Ivanovich Sudarikov. Creation Year: 1860s. Creator Dates: was active in 1840-1860s in Moscow. He began his study as pupil of Gerdt Hardorff and Leo Lehmann, studied from 1821 at the academy of Dresden and then under Peter Cornelius at the Dresdener Academy. He moved with Cornelius in 1825 to Munich, to assist him at painting the frescoes in the Glyptothek. Creator:Leopold Steinrucker. Creation Year: ca 1840. Style: Portrait Miniatures. MALE PORTRAIT. Creator: Leitzing. Agnes von Scholten, nee Foerster (Förster), was born on October 12, 1810 in the village Padligar by Sulechow, Prussia (now, Podlegorz, Poland). In November 1828 (by then she had obviously already lived in Berlin - sic!). Creation Year: ca 1810. Technique: watercolor on paper. Style: Portrait Miniatures. Condition: In good condition. Creation Year: 1833. Creator Dates: 1809 Hanau-1880 Hanover. Creator:Conrad L'Allemand. Style: Portrait Miniatures. Technique: charcoal and whitening on paper. FEMALE PORTRAIT. Louis Letronne (1790-1842)-Attrib. "Portrait of Olympe Bellard"
Was a very popular French portrait miniaturist, pupil of J.L. David. In 1805 (other sources indicate 1809) he moved to Vienna and worked there as graphic artist at Danhauser's Furniture Manufactory. Johann B. Zukowa was a well listed Viennese portrait painter of the 1st half of the 19th century. He had exhibitions at the Vienna Academy of Fine Arts in 1839 and 1840. He is considered a skillful artist who painted in the typical Viennese Style. Creation Year: 1813. Creator Dates: 1784-. Johann Bernard - a Viennese drawer, who studied at the Vienna Academy during the end of the 18th century and was later also known as print-maker. Creator:Johann Bernard. Style: Portrait Miniatures. Technique: charcoal with whitening. MILITARY PORTRAIT. MALE PORTRAIT. Creator: German School. Nationality: German. In 1813, together with her mother, she went to Paris. She made acquaintance with famous artists Francois Gerard and Jean-Baptiste Isabey, as wells as (her future great friend) actor Talma. Under the guidance of Francois-Gedeon Reverdin, she copied antiques at the Louvre. 7) we are here dealing with a unique (!). portrait of Anne Caroline Renée, Baroness de Grenus, nee Saladin (1758-1814; see our image nr. 9 with her biographical information). She was born in Geneva as a daughter (third from five children) of Geneva high official, owner of the castles Crans and Arnex by Nyom, Switzerland (1725-1811; see our image nr. Johannes Notz (1802-1862) "Portrait of Lady Erica Catherine Farquhar"
(Johannes Notz was born in 1802 in Oberstrass near Zurich. The last years of his life he spent in Zurich, where he died in 1862. Creator: Johannes Notz. this portrait is dated 1835) wife of Sir Walter Minto Townsend-Farquhar (see our image nr.7). Creation Year: 1820s. MALE PORTRAIT. Style: Portrait miniatures. Creator: Italian School. Nationality: Italian. Widely known are his drawings from Napoleonic Wars. Works of Raymond de Baux can be seen in various museums. Creator: Raymond de Baux. Creation Year: 1840. Creator Dates: 1785-1862 Berlin. FEMALE PORTRAIT. Both portraits were drawn in the period of Liberation (anti-Napoleonic) Wars (1813/15). We are very grateful to well-known Moscow uniformologist, specialist in Prussian military uniforms Stanislav Lyulin for his generous help. Ernst Kietz (1815 Leipzig - 1892 Dresden) was a well-known German portrait graphic artist and lithographer. In 1831-38 he studied at the Dresdener Academy, then moved to Paris where he studied portrait painting under Paul Delaroche. He exhibited portraits at the Salon de Paris of 1837. Creator: Jean-Baptist Mutin. MALE PORTRAIT. Style: Portrait Miniatures. Technique: charcoal and whitening on brownish paper. GROUP PORTRAIT. LITTLE BOY. Christian Olsen (1813-1898) "Portrait of Georg Sibbern", high quality drawing!! It is a work of (working from 1843 in Norwegian capital Christiania; now - Oslo) Danish artist Christian Olsen (1813-1898; for his extensive biography, see our image nr.9; for other works of Christian Olsen). Mme Amelie Munier-Romilly "Lady with her two children", high quality drawing!! Henrik Jakobus Scholten (1824 Amsterdam - 1907 Heemstede) was a pupil of P.F. Greive and L.J. Hansen. Scholten exhibited regularly in Amsterdam, Groningen, Rotterdam and Zwolle. His works belong to collections of Rijksmuseum, Stedelijk Museum, Museum Fodor (all Amsterdam), Museums of Haarlem, Rotterdam, etc. Heinrich Marr was born in 1807 in Hamburg. He studied at the Academy of Copenhagen under Friedrich Rosenberg and was active in Munich from 1825. Works by the artist are displayed at the Neue Pinakothek in Munich, at the Kunsthalle in Hamburg, the Kunsthalle in Karlsruhe, etc. Auguste Henri Joseph Pidoux was a portrait painter and lithographer in Paris where he exhibited at the Salon in 1834-1849. Creator:Auguste Pidoux. Creation Year: 1850. Technique: charcoal and white chalk on paper. Carl Friedrich Koepke (exh.1820-1846) "Portraits of husband and wife"
And indeed: the author, Carl Friedrich Koepke, lived in 1820/40s in Berlin, where he studied at the Berlin Academy of Fine Arts (sic!). Between 1820 and 1846 he regularly showed his portraits in oil, watercolor, charcoal and miniature portraits on ivory at Berlin Academical Exhibitions. Franz Wolf-Attr. "Group portrait of 15 officers of the 1st Arcieren Life Guards"
Franz Wolf (1795 Vienna - 1859 Vienna) studied at the Viennese Academy from 1811 and later worked as portrait and landscape painter in Vienna. Works by him can be seen in various Viennese museums. Creator: Franz Wolf.